A couple of years ago a story surfaced about a gamer who wrote about how he'd discovered his dead father's ghost in an old Xbox game they used to play together. 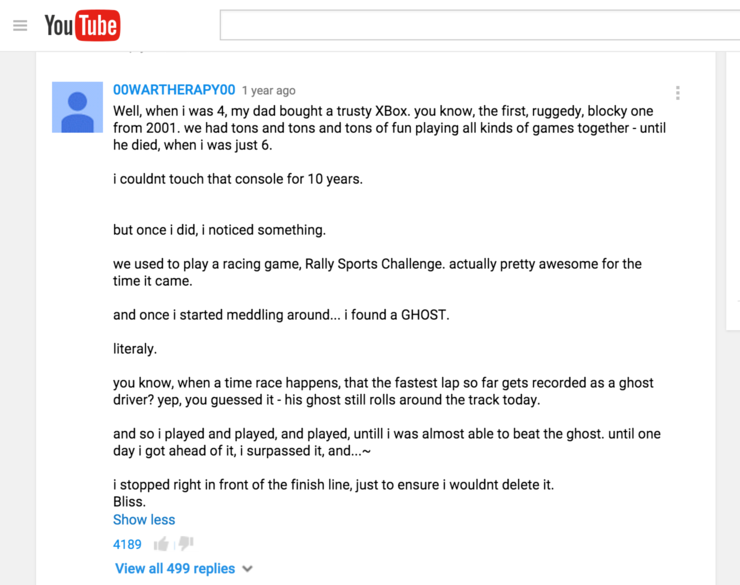 YouTuber user 00WARTHERAPY00, who was 6 years old when he lost his dad, told the story in the comments of a video titled "Can Video Games Be A Spiritual Experience?" He recalled how when he was 4 years old his dad had bought an old Xbox, the first one that came out, which him and his dad used to play together. After his dad died he couldn't play it again because it was too painful, but about 10 years after he'd passed he picked up the Xbox and started to play an old racing game they used to enjoy, RalliSport Challenge. It was in this game that he discovered the ghost. The ghost was from a time race his father had completed, and because he'd completed the course in the fastest time his car was still going around the track as a ghost driver. "His ghost still goes around the track today." says 00WARTHERAPY00. It meant that 10 years after his death 00WARTHERAPY00 could still race alongside his dad, speeding along like he would have done all those years ago. He dare not beat the time though, because it would mean erasing his dad's ghost car for good. The video above Player Two by filmmaker John Wikstrøm has taken the story and created a very poignant short film from it. It's touching and heartfelt and really does justice to the emotional story told by 00WARTHERAPY00. You can see the full comment below. And check the resulting short film above.